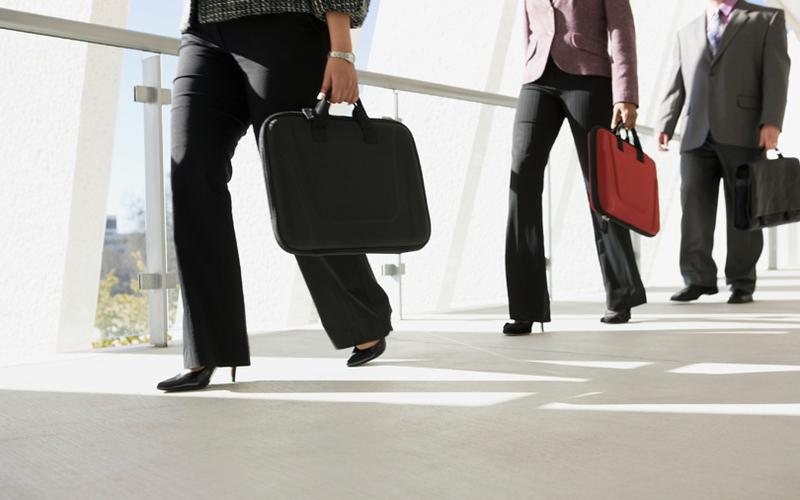 Pay packages of women directors in Indian companies have shown a handsome increase of late, but the gap between their remuneration and that of their male counterparts continues to prevail. The median remuneration of India’s 10 highest-paid women directors increased 10.53% in the year through March 2017, a VCCircle analysis shows. That’s higher than the 7.83% hike in median remuneration of the 10 highest-paid directors. However, the actual remuneration of most of these women directors is lower than that of their male counterparts. The analysis is based on data collated from Capitaline and annual reports of only listed companies. Some large multinational firms, including investment banks, have women chiefs but their compensation is not in the public domain. Also, the analysis takes into account only cash compensation. Sun TV Network’s executive director Kavery Maran continues to top the list with annual remuneration of Rs 77.9 crore. She is also the only women in the list of highest-paid directors, irrespective of gender, compiled by VCCircle. Sun TV Network operates satellite television channels in four south Indian languages and has FM radio stations across India. The company has the franchisee rights for the Hyderabad cricket team in the Indian Premier League. It made a net profit of Rs 1,030.6 crore for the year ended 31 March 2017. Vinita Gupta, chief executive of homegrown drugmaker Lupin Ltd, is a distant second with a cash compensation of Rs 17.3 crore. She is also among the 10 highest-paid healthcare executives in the country. Nina Puri, whole-time director at Noida-based ISGEC Heavy Engineering, is third on the list. 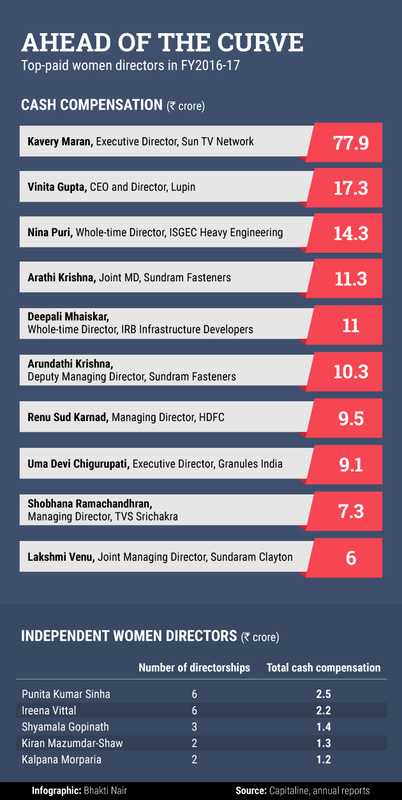 Deepali Mhaiskar, ranked fifth, was elevated as a whole-time director at IRB Infrastructure Developers in May 2016. Her husband, Virendra Mhaiskar, is the company’s chairman and managing director. Four members of the TVS family—sisters Arathi Krishna and Arundathi Krishna, Shobana Ramachandran and Lakshmi Venu—feature in the top 10. Arathi and Arundathi—daughters of Sundram Fasteners chairman and managing director Suresh Krishna—are directors at the automotive and engineering parts maker. Ramachandran—daughter of former group chairman R Ramachandran, who passed away in 2004—is managing director at tyre maker TVS Srichakra. Venu—daughter of TVS Motor Company chairman Venu Srinivasan—is joint managing director at auto-components maker Sundaram Clayton. Punita Kumar Sinha and Ireena Vittal are at the top among the highest-paid independent women directors. They also featured in the list of 10 highest-paid independent directors in the country. Others on this list include Shyamala Gopinath, Kiran Mazumdar-Shaw and Kalpana Morparia. Gopinath, a former Reserve Bank of India deputy governor, is on the boards of consumer goods firm Colgate Palmolive, engineering design and services company Tata Elxsi and private-sector lender HDFC Bank. Mazumdar-Shaw—founder, chairperson and managing director of biopharmaceutical major Biocon—is an independent director of Infosys and United Breweries. Morparia is the CEO of JP Morgan India. HDFC managing director Renu Sud Karnad is the only non-promoter in the list of the 10 highest-paid women. The other highest-paid women professionals are Axis Bank chief executive Shikha Sharma (Rs 5.74 crore), ICICI Bank managing director and CEO Chanda Kochhar (Rs 5.54 crore) and ICICI Bank executive director Vishakha Mulye (Rs 3.44 crore).